Things are a little crazy up in here. Ashlyn's IEP (our annual meeting with the school district) was on Thursday and I'm still recovering. They are quite stressful and not my favorite. She'll be mainstreamed into a first grade class at our local public school come September. We are thrilled that she will stay on track and not be driving as a freshman. And 5'9 in the fifth grade. And I'm so proud of how hard she works. We know she will do great. Even though she'll probably have to lose the bunny ears. We leave for a few days of camping tomorrow night. I like to pretend I'm a camper. Lots of loads of laundry. And cooler and beach chair borrowing from neighbors. And food and dessert prep. Like this sour cream almond pound cake that is baking right this very second. I'm making it for Hope's Easter brunch tomorrow and Pintertesting it for Thursday. The smell alone makes me want to give it rave reviews without even trying it. Also, I've discovered that the Pintertest Kitchen linky party is way more fun when bribery is involved. 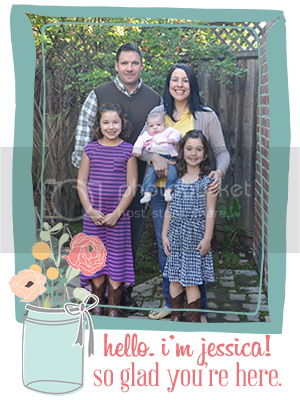 So Julie is giving away the cutest printable ever to one lucky linker. One final note, if you don't have a place to worship tomorrow, come to Hope! 13 on 10: I Cheated a Little. 10 (or maybe 13) photos taken on the 10th of the month. Pintertest Kitchen 18: It's Not You Enchilada Pasta Casserole, It's Me. So I'll just be honest. This dish was not my favorite. My kids wouldn't really look at it. But they decided they are vegan now. Well, vegans who eat chicken nuggets. I don't know that I will repeat it. I might have screwed it up by replacing the egg noodles with ziti. And I served it in the same dish as my regular ziti. Which is his favorite of all time. So he described this as a ziti oasis. Also, it was difficult to make look pretty. Mine was less festive red like the picture and more brainy gray. And I just don't trust gray food. Maybe I needed some parsley. On a happier, more redemptive note, I made these a while back and they are delicious. I struggle to find words here. And quite honestly, I want to avoid them. But doing so would rob God of glory. And I'd rather not do that. So I share my little story. And I will be honest. Many women have struggled far longer, some forever. I don't feel fit to share. I'm not trying to make this my platform. I'm not claiming to be an expert. But I keep being brought back to God's glory. Rewind to November of 2010. We learned we'd be adding a third little one to this house of crazy. Shortly thereafter, we lost that baby. I was surprised and sad. But convinced God would give us another baby. Because all our other pregnancies had happened that way. Months of waiting became years of waiting. And this past fall, I had given up hope. Convinced that God's plan for us was to be a family of four. And I was learning to be content in that. I have never been closer to Him. We had lots of chats, Jesus and I. And this past Christmas, we learned of a great blessing. In early September of this year, Lord-willing, we'll welcome a new little baby into our home. For this precious new life. But also for what I have learned while waiting. Not just in the valleys. And you'd rather poke their pregnant eyes out. Be gracious to other women around you. Not many knew of my struggle because I felt weak sharing. And so many have more painful stories. Be careful with your words, pregnant ladies. Be careful with your complaints. Many women would give anything to feel morning sickness. They are so powerful and give such hope. This new little baby is a HUGE gift. But the waiting was more of one. I pray Jesus never lets me forget that.